Surgery: there are 3 different types of surgery that can be used to treat bladder cancer depending on the stage of the cancer and type of tumour: transurethral resection, partial and radical cystectomy. Surgical procedures can range from endoscopically removing tumours (transurethral resection) that have developed in the bladder lining to removing the entire bladder and some surrounding tissue. More information on surgery to treat bladder cancer is provided in the next section. Radiation therapy: bladder cancer is often treated using external beam radiation when a person has advanced cancer or is unable to undergo surgery. Also, radiation therapy and chemotherapy, combined with transurethral resection surgery (described above), can be used in select cases to save a person’s bladder from removal. Immunotherapy: this type of treatment works to control and kill cancer by using natural and artificial chemicals that influence cell responses within the immune system. Immunotherapy is commonly used to treat tumours that are on the bladder lining but are a risk for further growth. In some cases, immunotherapy is used after chemotherapy or as a secondary treatment for more advanced stages of bladder cancer. Chemotherapy: chemotherapeutic drugs may be prescribed to slow or stop cancer cells from growing. The type of chemotherapy used depends on the stage of cancer development and type of tumour: intravesical chemotherapy (within the bladder) is used for bladder cancer that is isolated to the lining of the bladder, while systemic chemotherapy (injected intravenously) is used to treat bladder cancer that has spread to other areas of the body. Both types of chemotherapy are used before or after surgery, depending on the clinical situation. The roller coaster of emotions with cancer is absolutely brutal. Looking back, going to work and interacting with the public was the best decision I made. For my own sanity, it was very important. Transurethral resection: bladder cancer that is only located within the bladder lining is typically removed using surgery known as transurethral resection of bladder tumour (TURBT). More advanced tumours can be diagnosed and treated using this type of surgery. Radical cystectomy: this type of surgery involves the removal of the entire bladder, surrounding tissues, and (in some cases) reproductive organs. If this type of surgery is necessary, the person with cancer will undergo urinary diversion surgery to create a path for urine to exit the body. Neobladder reconstruction, which involves a surgical procedure to construct a new bladder, is one option for urinary diversion . The most common diversion, however, is an ileal conduit, which is a permanent external drainage bag for urine. I had to have a radical cystectomy, which included removal of the bladder and my reproductive organs. I had neobladder reconstruction, and [I] get to look ‘normal’ with a neobladder [i.e. with a drainage bag for urine]. But I have been incontinent ever since my surgery in January 2018. I wish I had more information prior to my surgery. In Ontario, wait time to surgery is measured for distinct periods. The first period, called Wait 1, is the time that the person waits for a first consultation with a clinician. It is measured from the time the referral is received to the date of the first consultation with a clinician. The second period, called Wait 2, is the period from when it is decided that the person needs surgery to the date they receive surgery. For both Wait 1 and Wait 2, people can be classified into 4 different priority levels (shown in Tables 1 and 2). The urgency for surgery varies, and the priority levels capture what Cancer Care Ontario considers to be the acceptable maximum wait time to surgery for these different priority levels. Many individuals will not have confirmed bladder cancer prior to surgery, therefore these recommended wait times do not apply to those people. For more information about wait times for cancer surgery in Ontario, see Wait Times for Cancer Surgery. I can't help but wonder if I would still have my bladder if the wait times for referrals to specialists would have been sooner. From the time my symptoms first appeared until I was finally diagnosed with bladder cancer was 6 months. For Wait 1, 60% of people with bladder cancer having surgery in 2016 were classified as Priority 4 (meaning they had a wait time target of 35 days), compared to 35% who were identified as Priority 3, and 5% who were identified as Priority 2 (Figure 1). Overall, 81% of bladder cancer patients in Ontario are receiving surgical consultations within their priority level wait time (Figure 2). With 65% of priority 2, 77% of priority 3 and 84% of priority 4 bladder cancer patients receiving surgical consultation within their priority level wait times (Figure 2). For Wait 2, 57% of people with bladder cancer in 2016 were classified as Priority 4 (meaning they had a wait time target of 84 days) (Figure 3). Comparatively, 4% and 39% of people with bladder cancer were classified as Priority 2 and 3, respectively (Figure 3). Overall, 90% of people with bladder cancer received surgery within their priority level wait time (Figure 4). For the most part, there has been minimal change in the percentage of people who received bladder cancer surgery within their Wait 2 priority access target, with the exception of Priority 2: 65% of people with bladder cancer had surgery in 2014 within their Priority 2 access target, compared to 73% in 2016 (Figure 4). † Values have been supressed due to small cell counts. All margins are included in the analysis. The figure is a flow chart with 6 labeled boxes linked by lines. Here the flow chart is presented as lists in which the connections are listed beneath each box label. Each box label includes the relevant number and percentage of cancer patients who had a breast, bladder, colorectal, prostate or thyroid resection. Due to rounding, percentages may not add up to 100%. The goal of bladder cancer surgery is to remove all cancer cells. After surgery, the removed tissue is examined to see if there are any remaining cancer cells at the edge of the collected sample . If cancer cells are present along the edge of the sample, this means that all of the cancer may not have been removed during surgery . This is called a positive margin resection. Cases of bladder cancer surgery with positive margin resection are tied to an increased recurrence and decreased survival rate. For that reason, it is important to minimize bladder positive margin resection rates. Currently, there is a surgical margin benchmark of less than 10% for bladder cancer surgeries . From fiscal years 2014/2015 to 2016/2017, the positive margin resection rate for bladder cancer was 14%. However, there was significant regional variation, with 6.4% to 38% of bladder cancer surgeries involving positive margin resection rates (Figure 5). Complications after bladder cancer surgery can result in an unplanned hospital visit after surgery. The rate of unplanned hospital visits after surgery can help monitor the number of complications or adverse events after cancer surgery, and it is a measure of the safety of the cancer system. Thirty-six percent of people with bladder cancer during fiscal years 2015/2016 to 2016/2017 had an unplanned emergency department visit, with half of them (18%) resulting in readmission (Figure 6). There was significant regional variation for both metrics. The percentage of people with bladder cancer who visited the emergency department ranged from 7% to 27%. Furthermore, after bladder cancer surgery, one region had no people with bladder cancer readmitted to hospital, while another region saw 26% of people with bladder cancer readmitted after cancer surgery (Figure 6). 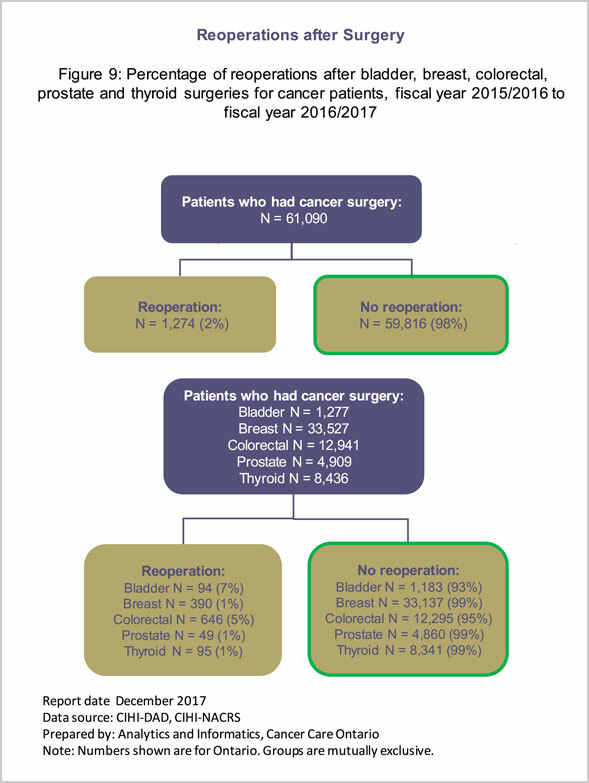 Only 64% of people with bladder cancer did not have an unplanned hospital visit after cancer surgery in fiscal years 2015/2016 to 2016/2017 (compared to 87% of people with thyroid cancer). I was not informed that my prostate would also need to be removed during the surgery, but the cancer had spread and there was a sense of urgency. Sexual dysfunction impacted the quality of our relationship as a couple. We had to work hard to redefine our relationship and ourselves. Of the 36% of people who did have an unplanned hospital visit, 18% had an emergency department visit only (compared to 10% of people with breast or thyroid cancer). 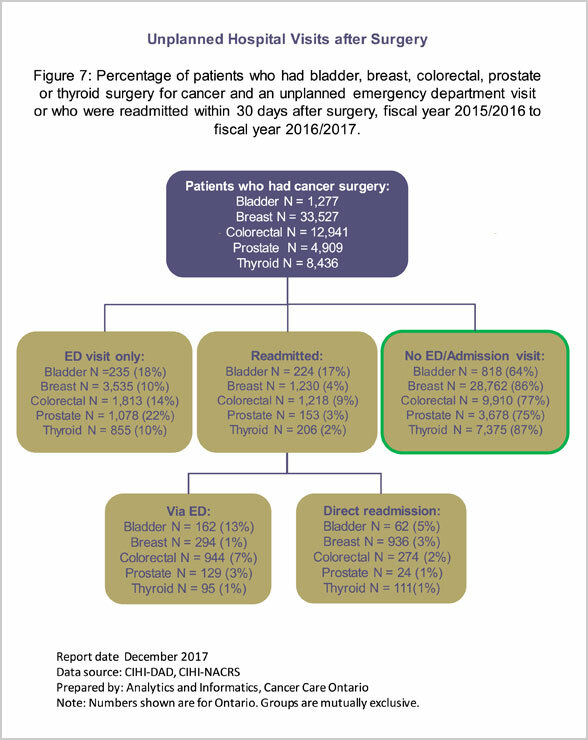 A greater number of people with bladder cancer were readmitted to hospital after surgery (18%) than people with thyroid cancer (2%) (Figure 7). Overall, people with bladder cancer are more likely to have an unplanned hospital visit after cancer surgery than people with breast, colorectal, prostate or thyroid cancer (Figure 8). Although the reasons for the unplanned hospital visit are unknown, some research suggests that reasons for emergency department visits or readmission include wound/urinary tract infection, nausea/ vomiting, dehydration, pulmonary embolism and pyelonephritis . Ileus and small bowel obstruction are other reasons that a person with bladder cancer may visit the emergency department or undergo reoperation after bladder cancer surgery. Reasons for reoperation include a reopened wound, ureterointestinal stenosis, parastomal/incisional hernia, and ureterointestinal anastomosis . For more information on unplanned hospital visits, see Unplanned Hospital Visits after Cancer Surgery. From a psychological perspective [of] someone who has never had surgery in his life, bladder cancer surgery had a huge impact, both physically and psychologically. Post-operative complications are one of the many reasons a person with bladder cancer may undergo an unplanned reoperation after surgery. A reoperation is defined as a secondary surgical procedure that is required as a result of direct or indirect complications following the initial surgery . For more information on this indicator, see Reoperations after Cancer Surgery. Overall, 93% of people with bladder cancer who underwent surgery did not have a reoperation in fiscal years 2015/2016 to 2016/2017. From a comparative perspective, 95% of people with colorectal cancer and 99% of people with breast, prostate or thyroid cancer did not have a reoperation within the same time frame (Figure 9). Overall, people with bladder cancer are more likely to have a reoperation (7% of them have a reoperation) after cancer surgery when compared to the other 4 disease sites (Figure 10). External beam radiation, the primary type of radiation therapy used for treating bladder cancer, uses X-rays or other high-energy particles to kill bladder cancer cells. The main machine that provides the radiation therapy is located outside of the body, unlike internal radiation therapy, where the radioactive treatment is placed into the body or near the cancer. In most cases, radiation therapy is used in combination with surgery and chemotherapy to treat bladder cancer more effectively . Radiation therapy may be the main treatment for people who cannot have surgery. It also may be given to relieve symptoms caused by advanced bladder cancer. More specifically, a study based in the United Kingdom that focused on the effectiveness of combining chemotherapy and radiation therapy found that 67% of individuals who underwent both interventions were cancer-free for 2 years. Comparatively, individuals who were treated using only radiation therapy had a 2-year recurrence-free rate of 54% . The same study also showed that individuals treated using both chemotherapy and radiation therapy had a higher 5-year overall survival than individuals treated using only radiation therapy (48% compared to 35%). Chemotherapy may be used to treat bladder cancer before cystectomy (neoadjuvant chemotherapy) or after cystectomy (adjuvant chemotherapy). The use of neoadjuvant chemotherapy to treat muscle-invasive bladder cancer has increased significantly, as it has proven to be a very effective treatment option. Rates of neoadjuvant chemotherapy have increased from 4% for the period of 1994 to 2008 to 19% for the period of 2009 to 2013 . This increase has continued yearly: rates for neoadjuvant chemotherapy rose from 12% in 2009 to 27% in 2013. Reasons for this increased rate of treatment can be linked to the increased referral rate of people with bladder cancer to medical oncologists, who are increasingly using neoadjuvant chemotherapy. Overall, both adjuvant and neoadjuvant chemotherapy have been proven effective to treat bladder cancer . Because bladder cancer is never highlighted as a major cancer, more efforts need to be put into research and public awareness. Measuring whether or not people have to travel to receive treatment is an important measure of the equity of our cancer system. Travelling long distances to receive treatment not only takes up more time for people and caregivers, but it also requires additional resources for travel that may not be readily available to everyone. It also affects overall quality of life. Immunotherapy uses the immune system to help destroy cancer cells. Immunotherapy often is used to treat tumours that are only in the lining of the bladder, but that have a higher risk for growing. The vaccine bacillus Calmette-Guérin (BCG), which is passed into the bladder through a urinary catheter (tube), is most often used . Other forms of intravenous immunotherapy may be offered as a second-line therapy for locally advanced or metastatic bladder cancer. Advanced bladder cancer is difficult to treat. First-line treatment is cisplatin-based chemotherapy treatment. However, 5 new immunotherapy medications are currently being approved by the United States Food and Drug Administration (FDA) to treat advanced bladder cancer. Further research is also being conducted to improve understanding of how different treatment options can be used to treat advanced bladder cancer and in what order those treatments should be administered to provide the best possible outcome . In Canada, bladder cancer is currently one of the most expensive types of cancer to treat . The high cost of bladder cancer treatment can be attributed to its high recurrence rate and the associated follow-up care that is needed to ensure an individual remains free of bladder cancer after treatment. This trend is mirrored in other international jurisdictions (such as the United States) . In 2009, same-day bladder cancer surgery in Ontario for those who lived past the first year of diagnosis was $1,700; the second most expensive cancer to treat with outpatient surgery was esophagus cancer at $1,689 (all figures in Canadian dollars) . Within the same time frame, treatment for bladder cancer cost the Ontario healthcare system an average of $20,858 for people who survived 1 year after diagnosis. Individuals who did not live more than 1 year after their diagnosis directly cost the Ontario healthcare system an average of $46,206. From a wait times perspective or quality of care from my doctors, I didn't have issues. But I do have issues with how bladder cancer is not funded like other cancers. I understand that it may not be the top disease site in terms of incidence, but it is just as important. Aside from potential costs associated with bladder cancer treatment, it is important to take into consideration the experience of people with bladder cancer. Despite the limited information about their experience, current research suggests that individuals coping with bladder cancer have worse experiences than those being treated for other types of cancer . Most people, men and women, are embarrassed by the cancer because it is part of the urinary system. People need to speak out . . . public awareness by people experiencing bladder cancer is critical. I'm not ashamed of my disease. lack of support after leaving the hospital . It should be noted, however, that the report did highlight the need to conduct further research related to the experience of people with bladder cancer to better understand why these trends exist and to address related weaknesses in the healthcare system . I did not get referred to a nutritionist or dietitian, even though I had bowel issues. My pelvic floor physiotherapist is actually the one who gave me a list of foods to avoid. Treatments for Bladder Cancer [Internet]. Toronto (ON): Cancer Care Ontario; c2018. Available from: here. Kassouf W, Aprikian A, Black P, Kulkarni G, Izawa J, Eapen L, et al. Recommendations for the improvement of bladder cancer quality of care in Canada: a consensus document reviewed and endorsed by Bladder Cancer Canada (BCC), Canadian Urologic Oncology Group (CUOG), and Canadian Urological Association (CUA), December 2015 [Internet]. Can Urol Assoc J. 2016;10(1–2):E46. Available from: here. Harraz AM, Osman Y, El‐Halwagy S, Laymon M, Mosbah A, Abol‐Enein H, et al. Risk factors of hospital readmission after radical cystectomy and urinary diversion: analysis of a large contemporary series. BJU Int. 2015;115(1):94–100. Liedberg F, Holmberg E, Holmäng S, Ljungberg B, Malmström PU, Månsson W, et al. Long-term follow-up after radical cystectomy with emphasis on complications and reoperations: a Swedish population-based survey. Scand J Urol Nephrol. 2012;46(1):14–18. Kroon HM, Breslau PJ, Lardenoye JWH. Can the incidence of unplanned reoperations be used as an indicator of quality of care in surgery? Am J Med Qual. 2007;22(3):198–202. Understanding Radiation Therapy [Internet]. American Society of Clinical Oncology; c2005–2018 (updated 2016 Dec). Available from: here. Tester W, Caplan R, Heaney J, Venner P, Whittington R, Byhardt R, et al. Neoadjuvant combined modality program with selective organ preservation for invasive bladder cancer: results of Radiation Therapy Oncology Group Phase II Trial 8802. J Clin Oncol. 1996;14(1):119–126. Booth CM, Karim S, Brennan K, Siemens DR, Peng Y, Mackillop WJ. Perioperative chemotherapy for bladder cancer in the general population: are practice patterns finally changing?. Urol Oncol. 2018;36(3):89.e13–89. Walker M, Doiron RC, French SD, Feldman-Stewart D, Siemens DR, Mackillop WJ, et al. Perioperative chemotherapy for bladder cancer: a qualitative study of physician knowledge, attitudes, and behaviour. Can Urol Assoc J. 2108;12(4):E182–E190. Karam JA, Wood CG. Genitourinary cancer. In: Feig BW, Ching CD, eds. M.D Anderson surgical oncology handbook. 5th ed. [place unknown]: Lippincott Williams & Wilkins; 2012. p. 604–635. Godwin JL, Hoffman-Censits J, Plimack E. Recent developments in the treatment of advanced bladder cancer. Urol Oncol. 2018;36(3):109–114. Santos F, Dragomir A, Zakaria AS, Kassouf W, Aprikian A. Health-care services utilization and costs associated with radical cystectomy for bladder cancer: a descriptive population-based study in the province of Quebec, Canada. BMC Health Serv Res. 2015;15:308. Sievert KD, Amend B, Nagele U, Schilling D, Bedke J, Horstmann M, et al. Economic aspects of bladder cancer: what are the benefits and costs? World J Urol. 2009;27(3):295–300. de Oliveira C, Bremner KE, Pataky R, Gunraj N, Chan K, Peacock S, et al. Understanding the costs of cancer care before and after diagnosis for the 21 most common cancers in Ontario: a population-based descriptive study. CMAJ Open. 2013;1(1):E1–8. Flannery K, Cao X, He J, Zhong Y, Shah AY, Kamat A. Real world treatment costs and resource utilization among patients with metastatic bladder cancer. Ann Oncol. 2017;28(5). Edmondson AJ, Birtwistle JC, Catto JW, Twiddy M. The patients’ experience of a bladder cancer diagnosis: a systematic review of the qualitative evidence. J Cancer Surviv. 2017;11(4):453–461. Bladder Cancer: Diagnosis and Management [Internet]. National Institute for Health Care and Excellence; c2018 (updated 2015 Feb 15). Available from: here. Garg T, Connors JN, Ladd IG, Bogaczyk TL, Larson SL. Defining priorities to improve patient experience in non-muscle invasive bladder cancer. Bladder Cancer. 2018;4(1):121–128.